Here is a photo of my lunch yesterday. Don't get me wrong; the burger was delicious. 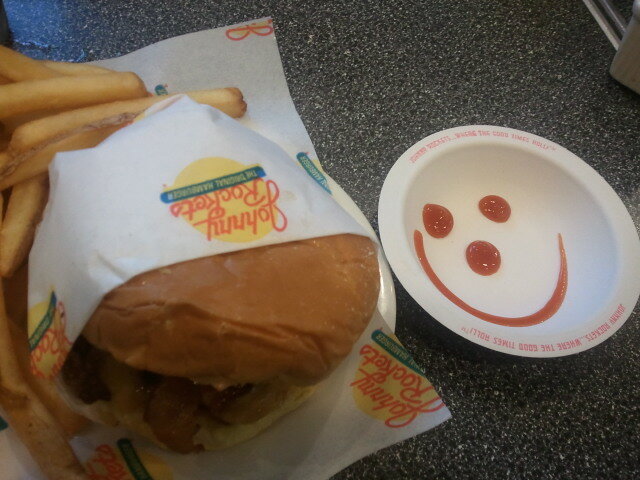 But did I really need a whole cardboard dish with a smiley face in ketchup? I don't even like ketchup. However, I think the environmental footprint of a cardboard plate with a teaspoon of ketchup is nothing compared to the footprint of that piece of meat. That Johnny Rockets burger on its way to your plate has contributed to water pollution, loss of biodiversity, land degradation, deforestation, etc… not to mention methane and other GHG. Maybe next time get a veggie one and say no smiley plate SVP. Guilty as charged. But it was sooo good :) I am doing a pretty good job of not having too much meat though and with choosing less bad meat normally. Some days though, a delicious, juicy burger is just too tempting. Really though, there is a more important point here: Telling people they have to go without is a very bad way of going about winning more support for efforts to reduce climate change. The option of a nice juicy burger should always be there. Pollution should be properly priced not got rid of all together. That will naturally reduce pollution (in this case meat-eating, which is far too cheap in the US, largely due to subsidised corn). Similarly, whilst people should be careful about turning off lights when not required and not leaving their car idling, telling people to cut down of everything without a price incentive is doomed to failure. Cars are left idling in Tehran because fuel has been almost free for a lot of the recent period. CFCs could still be with us now if people were told they would have to go without fridges and deodorant (as, in fact, a part of industry did try to do). Rather, there are ways to generate greener electricity, to produce and eat healthier and greener meat (and consume less of it). It is about investment, reliable and predictable legal frameworks and prices which integrate the negative externalities. In short, it is about the right incentives. I will happily look forward to my next burger. Although, admittedly, I want it to be as natural as possible and priced in a way that integrates the pollution I am causing from eating it and, crucially, not paid for with corn-subsidies which contribute to it being both unhealthy (cows should be grass, not corn-fed) and stupidly cheap.